No actually. The Bible doesn’t say Christians shouldn’t judge. It is sometimes claimed that the Bible commands Christians to not judge. Often we hear this from those who wish to silence Christians on the supposed grounds that their faith forbids any critical assessment at all of others. “Don’t judge, lest you be judged!” comes the retort. Apparently, some think the Bible commands Christian to never object to the attitudes, behavior, or activities of others in any way, shape or fashion. We are just supposed to take everyone as they are, and never think anything negative of their actions or find any fault in their behavior. But is this true? Does the Bible tell Christians not to judge, understood in this way? In this essay, I will argue that this idea is only partially true, but mostly false. Yes, we are to take folks as they come. We are to welcome sinners for we are all sinners dependent on the grace of God. But, Jesus simply did not teach his followers to never judge the behavior of others. In fact, he taught the exact opposite. The relevant passage on this issue is Matthew 7:1-6, which comes at the tail-end of Jesus’ famous Sermon on the Mount. 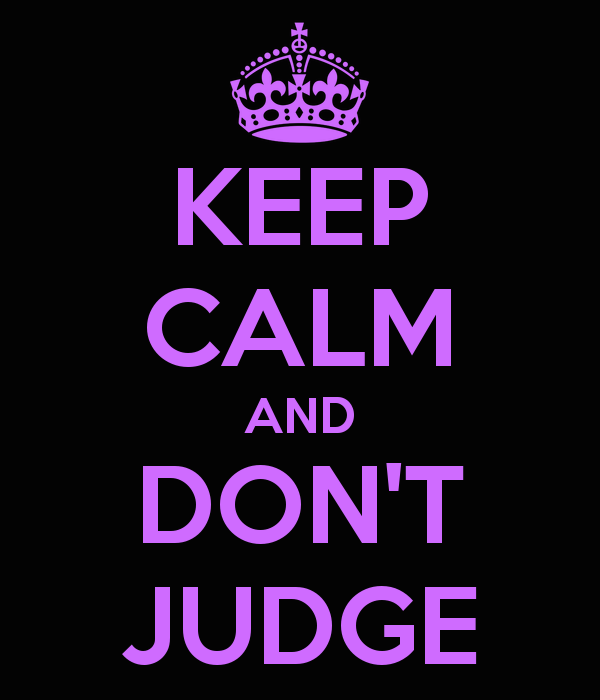 Here Jesus says, “Do not judge so that you will not be judged. For in the way you judge, you will be judged; and by your standard of measure, it will be measured to you.” Now, if this were the end of the matter, then it might be accurate to think that Jesus commanded his followers not to judge anyone, ever. But of course, as is always the case, this verse has a larger context (and one which is almost always ignored by those wishing to silence their Christian friends). In fact, if we continue, we see that Jesus has in mind a very specific type of judging, and not only does He not forbid judgment in the broad sense, but he goes on to describe how one can better judge rightly. In verse 5 of this same text, Jesus says, “You hypocrite, first take the log out of your own eye, and then you will see clearly to take the speck out of your brother’s eye.” Notice how this verse closes: “to take the speck out of your brothers eye. Jesus is making a couple of important points here relating to how we reflect on the actions of others. First, self-criticality must be extravagantly greater than our critical thoughts directed toward others. The differences are massive: our faults being a plank, and faults of others described comparatively as a speck of dust. Those we wish to criticize may indeed have a bit of sawdust in their eye. We have a 2×4. Work on the 2×4 first, then you can address the speck. The word “hypocrite” is key. Jesus is addressing those who are content to pass judgment on others, but have no ambition for considering their own shortcomings. And He will have none of it. But in such a context, one might have thought that Jesus would have told such persons to never judge at all. But he doesn’t. Rather, he gives them guidelines on how to have sounder judgment. The key is to begin not with the sins of others, but with one’s own sins. Then, the self-examined life that has presumably repented and turned to God, will have the resources and the credentials with which to approach others, not for the purpose of condemnation, but for gentle correction (Paul says exactly the same thing in Gal. 6:1). In fact, Jesus Himself says something very similar in John’s Gospel, when He says, “Do not judge according to appearance, but judge with righteous judgment” (John 7:24). Notice here again, Jesus does not say don’t judge. He simply says judge fairly and righteously. Second, the word “brother” in this passage (vv. 3-4) signifies that the audience in question is Jesus’ disciples. Jesus is talking about how his followers are to address their grievances with one another, not issuing a blanket statement about never judging anyone, anywhere, anytime. In other places, Jesus explicitly tells His disciples to be wary of others. For example, He says, “Watch out and beware of the leaven of the Pharisees and Sadducees” (Matt. 16:6). How could Jesus’ disciples carry out this command if they were supposed to go around willfully ignorant of the activities and motives of others, as this idea of non-judgmentalism suggests? The answer is they couldn’t, nor did Jesus expect them to. To say that the Bible plainly forbids Christians from making judgments about others is simply absurd. First, it is a practical impossibility, as we all make hundreds of judgments every day about others. We have to judge if the person who works at the daycare is fit to care for our child. Do they have the proper background checks and clearances? We judge whether the person knocking at the door claiming to be selling vacuum cleaners is really who they say they are, or not. We make judgments about whether the news we watch is trustworthy, about whether politicians are telling the truth or not (of course they’re not! ), and whether or not the dozens of people we encounter every day are dealing fairly with us or whether they’re trying to take advantage of us in some way. One would have to become a hermit in order to never make any judgments about anyone’s actions or behaviors (and even then it seems highly unlikely). The point here is, beyond the point already made that Jesus never taught his followers to never judge anyone, that no one can or should live a life in which no judgments are ever made about others. Rather Jesus taught his disciples a way of dealing with their differences that started with self-examination and not making light of one’s own sins. Then, when that is embarked upon wholeheartedly, one can offer gentle corrections to others out of love and concern for their well-being. Cast out the beam of love of the world! Love not the world, neither the things of the world. Be thou crucified unto the world, and the world crucified unto thee. Only use the world, but enjoy God. Seek all thy happiness in him! Above all, cast out the grand beam, that supine carelessness and indifference! Deeply consider, that “one thing is needful;” the one thing which thou hast scarce ever thought of. Know and feel, that thou art a poor, vile, guilty worm, quivering over the great gulf! What art thou? A sinner born to die; a leaf driven before the wind; a vapour ready to vanish away, just appearing, and then scattered into air, to be no more seen! See this! “And then shalt thou see clearly to cast out the mote out of thy brother’s eye.” Then, if thou hast leisure from the concerns of thy own soul, thou shalt know how to correct thy brother also. John Wesley and Charles Wesley, “Upon Our Lord’s Sermon on the Mount,” Selected Works of John and Charles Wesley, Accordance electronic ed. (Altamonte Springs: OakTree Software, 1997), n.p. ← Should Evangelicals Believe in Purgatory? Great blog from Jerry M. Ireland!